Does a fantastic Singapore Chilli Crab at a bargain at INR600 (£7.80). That’s all. I don’t think you’ve lived in Bangalore until you’ve eat at a Darshini. It’s the Indian equivalent of a fast food joint at ridiculously cheap prices with generally much better food than you’d get at any McD’s or KFC. Popular ones are busy at most times of the day, and we’re lucky to have three very good ones in walking distance to our office. Eating is simple. Order and pay at one counter and you’ll receive a food receipt and a drink receipt. Pass the food one to someone behind the food counter, and the other to the cannisters that sit at another. 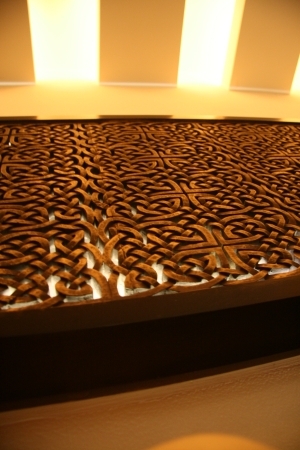 You’ll soon receive your food as it’s freshly prepared. Don’t expect plush ambiance at darshinis and one of its unique drawcards is that it’s standing room only. Live by the zero-second rule (don’t bother picking up food if it’s dropped) and focus only on the food on the metallic plates you’re served on. Relish the coconut chutney and sambah with whatever you may have ordered: be it a dosa (crepe like bread), some idlies (steamed bread) or some vada (fried bread). As long as you stick to popular dishes, chances for food poisoning is minimal with most of it being freshly made in front of your eyes. Tea or coffee starts at only INR5 (6p) and most meals ranging between INR20-40 (25p-52p). Most of them even offer you the option of getting your food wrapped which is based on a few banana leaves, wrapped in newspaper and then drawn together with string. Geoffrey’s – Like Ginseng, this restaurant is also located in the Royal Orchard Hotel off airport road (1,Golf Avenue). Geoffrey’s is actually a pub with a big screen showing matches from European football. Food on offer ranges from continental to a smaller selection of Pan Asian foods (we think some offered from Ginseng upstairs). Food quality is generally pretty good with nicely sized portions at reasonable rates. We had a few pitchers of beer, some dinner and it ended up around INR800. 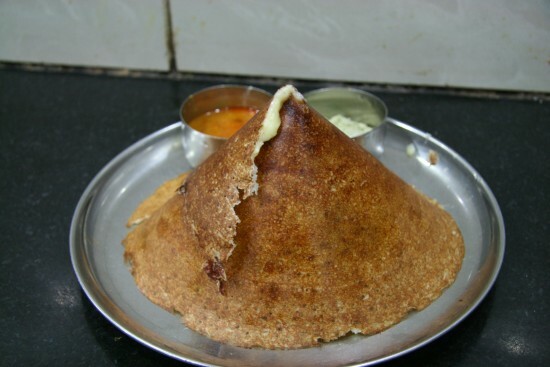 Koshy’s – A popular restaurant found up one end of MG road on St Mark’s Road. As you enter the restaurant, you walk under a big Fish and Chips sign, obviously showing heavy continental and English influence. One side of the restaurant offers white table clothed-dining rooms while the other offers a less formal dining experience. Large pillars and impressive fans whirl, cooling its dining guests. They offer plenty of Indian food as well (pretty much all we ate there) as well as a few beers. I’m not sure how much it ended up being for the four of us there. 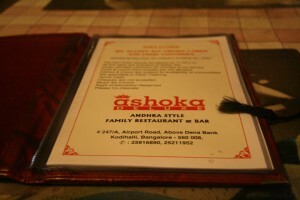 Ashoka Deluxe – The restaurant found in the hotel of the same name, this one focuses on Andhran cuisine (the spiciest of the Indian regions). 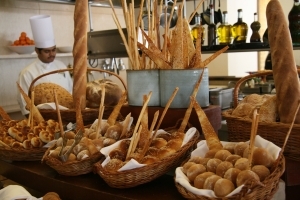 Their prices are very reasonable at well under INR100 each, and a decent selection of breads starting from INR15. Best yet is the local Kingfisher beer, with a large bottle setting you back INR77. Total price for a meal INR177. TGI Fridays – A very popular joint, especially with the ex-pat crowd that serves overpriced beer and westernised food. A redeeming feature is the happy hour specials that run until about 8pm but still cost double compared to a more local place. A trait that seems to run common here is that quite a few people ended up with food poising from here. Ginseng – Located in the Royal Orchard Hotel off airport road, this pan-asian restaurant focuses mainly on Thai and Chinese food though also offers a couple of Singaporean offerings. It’s generally on the more expensive side (for India), with starters, a main and some beers costing about INR1200 per person. Food quality is very good though and despite the curries not being as hot as they could be, definitely had a good kick to them. The restaurant itself didn’t get as busy as it could have while we were there. In fact, only one person occupied a single table (out of the thirty or so) when we arrived though filled up in the next couple of hours. I’d definitely come back here and try the Singapore Chilli Crab at only INR700. Sethji Home Made Foods – A great local place that offers some great varieties of paratha. Very cheap at only INR40 for a couple of fresh paratha’s with some sauces to dip them into. As hinted at the name, it feels like one of those local restaurants someone is running out of their own home. Definitely recommended for some nice fresh food. Found at: 2148 8th Main 2nd Cross Opposite KEB Hal 2nd Stage Indiranagar, Bangalore East. Mainland China – Chinese cuisine with an extensive food menu (almost like a book!) with a list of interesting cocktails as well. We ate at the two floored one, that was actually not too bad. Lots of different dishes to choose from here, with lots of meat, vegetarian, rice and noodle dishes. Price per head for a large meal including a couple of drinks ended up around INR650. We ate at the one located here: Golden Lights, No.4032, 100ft Road, HAL-II Stage, Indranagar, Bangalore. Brio the cafe Bistro – Found at a Crossword bookstore, this cafe has a couple of outdoor tables where you can drink some of the very milky coffee and tea with some cakes or biscuits. Very much set up in a Starbucks style with lots of cold drinks and many things with a light coffee basis, but probably missing out. Sitting outside is quite nice. I think this is the one we went to: 12th Main Road, 5th Cross Road. The Leela Palace is one of the most expensive hotels to stay at in Bangalore, apparently costing up to USD500 equivalent night. Internally it’s spectacularly decorated with rose coloured marbled columns holding up the high ceilings. As you walk into the complex, it’s easy to realise this is not your average hotel as you’re stunned with the smell of fresh rose petals. The Leela Palace is known for many things including its library room (to be covered in another entry) and its famous Champagne Brunch at their restaurant, Citrus. At INR2000 (£26) per person, this meal is comparatively much more expensive as a place to eat though is well worth the money for a special occasion. Its food range is unmatched by other restaurants in Bangalore, offering salads, soups, cold plates, Indian food, Chinese food, grilled foods, Japanese food, a number of Western dishes and an entire bar of desserts on offer. They even offer a specialised kids food section, at the perfect height for a very small child. Better yet, you can order pretty much any sort of drink you like although Indian champagne is the standard drink offered to everyone. Although I’m not a huge fan of champagne, the drink on offer is actually very drinkable. Looking around, there’s nothing stopping you from ordering alcoholic and non-alcoholic drinks, different types of lassis, other soft drinks and bottled water as well. I’m typically not impressed by service in places like this, but the waiters tended to come by enough to fill up our glasses, take away our plates and generally be around to ask for other drinks without being excessively “in your face”. We stayed for a decent three and half hours enjoying the alfresco dining and the cover band dishing out live music and managed to not stuff ourselves too much. It’s a great experience that I think you have to do once, and although apparently the Olive Beach offers a better brunch buffet, Leela still offers an impressive experience. Well I’ve arrived and it’s been pretty much, eating, sleeping and lots of teaching. It’s great hanging out with all the students (from all our various offices) and even though we don’t seem to leave the complex that much, there’s still so much to do. BBQ Nation – I think there are several of these restaurants that specialise in serving grilled shish-kebab like foods at the table. Waiters place a charcoal grill into the middle of a table over which they continue to bring pre-grilled sticks of meat and vegetables to continue cooking at the table. They also bring around various curries, tandoor foods, bread and rice to the table in addition to a full buffet covering even more curries, salads, soup and bread. 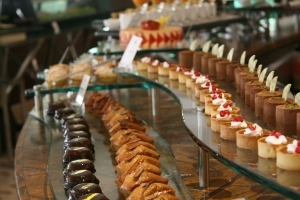 Also on offer is a dessert bar including combining traditional Indian and westernised desserts. I’m not sure how much this one is. 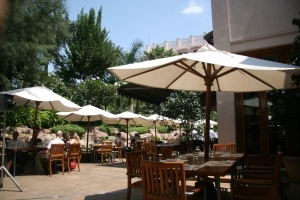 IndiJoe – A restaurant located in the complex containing TGI Friday’s and Bombay Post, serving continental food including tex mex, Chinese, Thai, mixed grills, pizza and pasta. A Two for one drink offer continues until about 8pm. Most meals average around INR600 in addition to drinks. Gregory’s – An English pub located in the Royal Orchard Hotel serving Chinese, Thai and a small amount of English food. This place tends to attract a more westernised and business crowd, including a couple of plasma screens showing European football. Meals average around INR400 with a pint (330mL) of beer starting at INR120.